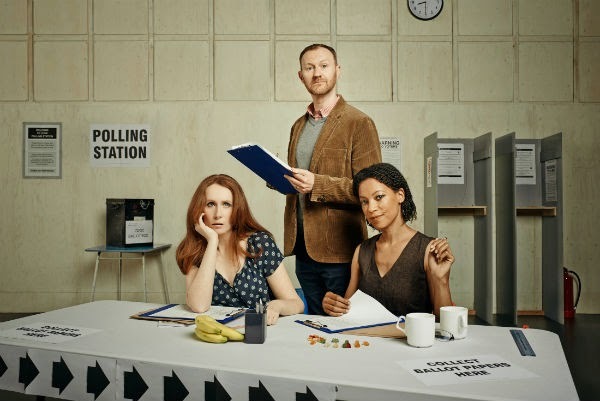 More 4 have partnered with The Donmar Theatre to broadcast James Graham's play The Vote live on the 7th May. The play is set during a fictional London polling station during the last ninety minutes of election day. More 4 is set to broadcast the play live in the time period the drama is set; precisely 8:30pm-10pm. The Vote looks at what happens in Britain on election night through the eyes of those at the polling station. Every five years we assert our right as citizens to uphold or replace our government – but, characteristically, we do it in the most unremarkable and understated of ways –at local parish churches, primary schools and community centres across the country. Set in a fictional polling station, James Graham’s new play shines a light on the diverse, diligent and often hilarious individuals who turn these unglamorous settings into places where history is made. Cast for The Vote includes Judi Dench, Mark Gatiss, Timothy West, Bill Patterson, Catherine Tate and Nina Sosanya who will play a variety of colourful characters. John Hay, Commissioning Editor for Arts, Channel 4 said, "lots of channels make programmes about artists, but at Channel 4 we try to give artists the chance to make programmes about us. The Vote is a major step forward in that long tradition. Josie told me when we first began talking about it we’d have a wonderful cast, but I’m still delighted and more than a little star-struck by the list. I’m hugely grateful to them for joining forces with her to realise James’ brilliant script, and to Twofour for bringing it to the screen in such an innovative way. The play's director Josie Rourke added, "broadcast live to the nation on the night of the General Election, this is a unique opportunity for the Donmar to make a small theatre feel very big. Some of the nation’s greatest actors are coming together this election night to give theatre a seat at the table of a national event. Everyone involved is approaching this experiment with a sense of adventure. To work with a playwright and company of this calibre and significance on such a bold project is a dream come true. When James Graham and I collaborated on Privacy, we were attempting something no-one had tried before. This is our next step in pushing the boundaries of how theatre speaks to audiences in a brave, new and popular language about the times in which we live. This huge acting company will be portraying a ninety minute slice of our nation as it goes to the polls. The scale and scope of this incredible company of actors is going to make this a very special event. This is the first time Judi Dench has been back on the Donmar stage since 1976. To have her at the heart of this incredible company of actors makes this great event a total joy.